KOTA KINABALU (March 21): Murals murals everywhere! And it looks like they are going to Sabah’s capital too. 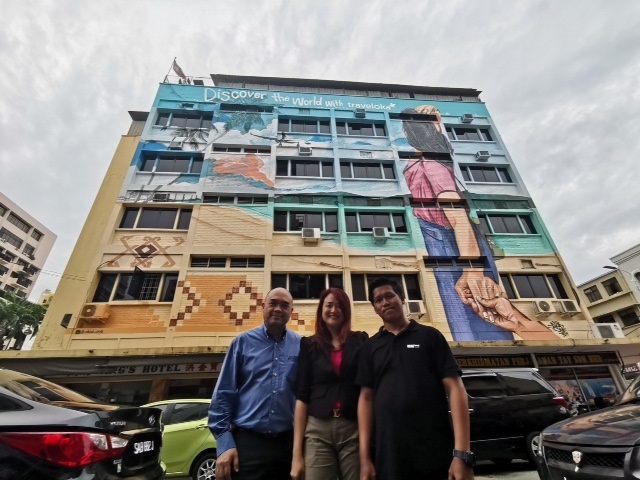 Traveloka, the region’s leading online travel company, has worked with Kota Kinabalu city hotel Ang’s Hotel to design the company’s first mural on a hotel. The mural marks Malaysia as the first country Traveloka is launching this initiative, the firm said in a statement yesterday. Ang’s Hotel is a building measuring 64 ft x 44 ft while the mural is a life-sized painting of a young couple at a local beach destination with a plane cruising in the sky, showing off how Traveloka “enables you to travel with your loved ones”. The design is based “on the concept of the ‘Follow Me To’ series” made popular by travel photographer Murad Osmann. The mural is designed by famous local street art artist Akid One, who made a name for himself when he immortalised two of Malaysia’s great leaders Tun Dr Mahathir Mohammad and Tunku Abdul Rahman on the side walls of a pair of shophouses in Alor Setar, Kedah. Akid One is also the grand prize winner of the second edition of “Make Your Mark in Melbourne” street art competition organised by Visit Victoria. “We decided to work with Akid One because his works display really strong local nuances. Through our first Traveloka mural, we want to inspire more people to create memorable moments with their loved ones by continuing to travel. “We hope that the tagline on our mural ‘Discover new places with Traveloka’ will serve as a reminder for the locals and visitors to expand their horizons and enrich their lives through the wonders of travelling,” said Angelica Chan, Traveloka Country Market Manager for Malaysia. Akid One started painting the mural on March 13, 2019 and finished it in five days. Ang’s Hotel is strategically located on a major tourist spot on Gaya Street in Sabah, making it the perfect location for a photo opportunity.